This section was inserted by Dr Blake Hsu in October 2018. The next review date is August 2021. Haemophagocytic lymphohistiocytosis (HLH) is a rare condition caused by an inappropriate and severe activation of macrophages and T lymphocytes resulting in excessive cytokine production. HLH can be primary or secondary. Primary HLH is familial and autosomal recessive. It is usually diagnosed in the first two years of life, but can present later. Familial HLH is subdivided into types 1 to 5. Common mutations associated with these types are listed below. These mutations are almost all null mutations that abolish critical proteins required for normal cytotoxic T cell and NK cell function. Samples can be sent overseas for testing of these mutations. Type 1: Unidentified mutation on chromosome 9q21. Type 2: Perforin gene mutation on chromosome 10q22 (6–58% of patients with F-HLH2). Type 3: UNC13D gene mutation on chromosome 17q25 encoding the Munc 13-4 protein (8-13% of patients with F-HLH3). Type 4: Syntaxin 11 gene mutation on chromosome 6q24 (20% of those with F-HLH4). Type 5: Syntaxin-binding protein-2 gene mutation on chromosome 19 which encodes for Syntaxin-binding protein 2 or Munc 18-2 protein. Haematological malignancies predominate, with more than 50% of cases caused by NK/T cell lymphomas. Infections, most commonly Epstein–Barr virus (EBV), respiratory syncytial virus (RSV), rotovirus, and adenovirus. Autoimmune disorders such as systemic lupus erythematosus (SLE), adult onset Still’s disease, and mixed connective tissue diseases. Post solid organ or haematopoietic stem cell transplantation. Hypertriglyceridemia > 3 mmol/L and/or hypofibrinogenemia < 1.5 g/L. Haemophagocytosis in bone marrow (BM), spleen, or lymph nodes. Not all patients have haemophagocytosis at presentation – diagnosis should not be delayed for this single feature. Low or absent natural killer (NK) cell activity. Ferritin > 500 micrograms/L (in adults, some authors believe this should be 3000 micrograms/L). Soluble CD25 (that is, soluble IL-2 receptor) > 2400 units/mL (or per local reference laboratory). NK activity and soluble CD25 cannot be measured in our lab. MAS is a condition with similar pathophysiology to HLH associated with rheumatological conditions, especially systemic juvenile idiopathic arthritis. These patients usually display neutrophilia and thrombocytosis rather than cytopenias. They often respond to an increase in their immunosuppression for their underlying rheumatological process and high dose intravenous immunoglobulin. If the patient continues to deteriorate and/or develop cytopenias, treat them as having secondary HLH. Untreated HLH is universally fatal. With treatment, 5 year survival is less than 50%. Upfront treatment for HLH depends on the underlying trigger for the disease. Familial HLH or idiopathic HLH are treated upfront with combination chemo and immunotherapy. The most common protocol followed is the HLH-94 protocol from a landmark trial in 1994. This protocol was subsequently modified in a second study in 2004. Both trials solely involved children but are used to treat adults in clinical practice. The main drugs used in these regimes are etoposide, cyclosporine, antithymocyte globulins (ATG), and steroids. Both trials involve an induction phase followed by a continuation phase that is carried on until haematopoietic stem cell transplant (HSCT) in the case of familial HLH, and a sustained remission in secondary HLH. Both regimes use intrathecal methotrexate in their induction phases. The main difference in the protocols is that the HLH-2004 study uses cyclosporine in the induction and maintenance phases as opposed to just the maintenance phase in HLH-94. The final outcome of the HLH-2004 study as to whether this made a difference in outcomes is still pending. Most clinicians still follow the HLH 94 protocol and avoid cyclosporine in the induction phase due to its toxicity. In the case of EBV-driven HLH, rituximab is added to the treatment regime. HLH secondary to underlying malignancy is treated initially with disease-specific therapy, with inclusion of epotoside into the treatment regime if appropriate. In treatment-resistant HLH, international experts recommend using alemtuzumab at a very high dose (2 mg/kg daily). HSCT is the only curative treatment for familial HLH. 100-day transplantation-related mortality (TRM) is more than 50%, with 50% of the deaths due to recurrence of HLH. The role for HSCT for secondary HLH is not clear as most data comes from trials involving F-HLH. However, it is increasingly recommended in refractory or relapsed disease. Reduced intensity conditioning such as with fludarabine and busulfan has been shown to be superior to fully myeloablative conditioning. Alemtuzumab has also been included into some conditioning regimes. Weaver LK, Behrens, EM, et al. Hyperinflammation, rather than hemophagocytosis, is the common link between macrophage activation syndrome and hemophagocytic lymphohistiocytosis. Curr Opin Rheumatol (2014), 26:562-569. 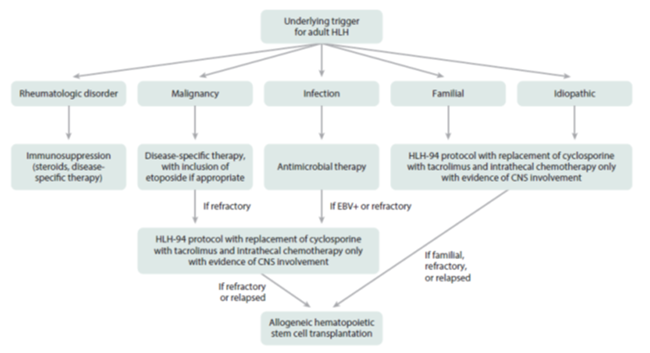 Mehta R, Smith R. Haemophagocytic lymphohistiocytosis (HLH): a review of literature. Med Oncol (2013), 30:740. Janka GE, et al. Haemophagocytic syndromes – An Update. Blood Reviews 28 (2014) 135-142. Schram A, et al. How I treat hemophagocyctic lymphohistiocytosis in the adult patient. Blood (2015), 125(19):2908-2914. Al-Samkari H, et al. Hemophagocytic Lymphohistiocytosis. Annual Review of Pathology: Mechanisms of Disease. (2018): 13:27–49.